There’s a problem. You haven’t crossed the finish line yet and odds are good you can’t even see it. By the time you do cross the finish, your GPS is telling you that you’ve run the race distance plus a quarter-mile or so and your exact PR is history. You’re annoyed, angry, and wondering how on earth your GPS and/or the course could be so very wrong. The good news? There’s absolutely nothing wrong with your GPS. The bad news? There wasn’t anything wrong with the course, either, assuming that it was a certified course. The problem was with the specific route that you took through the course. You may have been weaving back and forth to avoid other runners, but most likely you didn’t run the tangents around the corners. It’s a small thing, but over the course of a race (especially a longer-distance race like a marathon) it can add up to a significant chunk of distance. In this article we’ll take a look at how race courses are certified, what these “tangents” are, and how you can use that to your advantage in your next race. In order for a road race course to be certified by USA Track & Field (the governing body of American competitive running), it must be measured or validated by someone specially trained in measuring road courses. When a course has been certified by USATF, it means that “the shortest possible route that a runner could take and not be disqualified” is equal to the advertised distance. Essentially, any valid path through the race course must be at least the stated distance (e.g., 26.2 miles for a marathon). The end result of this is that the path taken by most runners may be longer than the required distance, but it will be impossible to finish the race (unless you’ve cheated) without running at least that far. What is the “shortest possible route”? Just as the shortest route around a track is along the very inside of lane 1, the shortest route along a road course takes the inside line of every turn. If there’s two or more turns in a row in the same direction, you stay in that inside “lane” to minimize the amount of weaving back and forth you’re doing. If there are back-to-back turns in opposite directions, you’ll want to run in a straight line from the midpoint of the first curve to the midpoint of the second curve, as pictured below. As we all know, though, you can’t always see your next turn in the course. This is where studying the course map and having a good idea of the turn pattern before the race can really come in handy. What if you’re heading down a road full of s-curves? The shortest possible route in that case is as close to a straight line through the curves as you can run. This is sometimes called “running the tangents” as your path through the curve isn’t a curved line, but a straight line that runs tangent to the curve. (A tangent is a line that is perpendicular to the curve at the point where the two figures meet.) In some cases, you might even be able to skip several curves by running a straight line through the entire section, depending on the size of the curves and the width of the course. The key benefit to running the tangents of a course is that you’ll cover less distance and, as a result, expend less energy. Not only will that let you run at a faster pace, but you’ll also get to the finish line faster as a result of covering less ground. Clearly this can only be a good thing, right? Unfortunately, unless you’re in the lead (or bringing up the rear) and are very familiar with the course, running the shortest route every time is next to impossible. Surprise turns may find you on the wrong side of the road to take the most efficient path through the curve and crowded course conditions can result in you needing to weave around other runners to avoid getting stuck in a slower pack. That said, a little knowledge can go a long way. Seeding yourself appropriately at the race start can help reduce the amount of weaving you’ll need to do (as can entering smaller races), and applying the above principles, even imperfectly, can still reduce the amount of extra distance you run. While it may not add up to much over a 5k, over the course of a marathon you could save yourself up to an extra half mile or so. Have you ever been upset because your GPS measured a course long? Do you run the tangents? It’s important for runners to realize that any certified course should measure long by GPS. Both because of the tangent issue and because a certified course IS actually a little long. A certified course has an extra meter for every 1000 meters the certifier measures. This means a marathon is long by about 42 feet! That’s not that much really, but it’s something. If a GPS measures a course short, it almost certainly is. That being said, I would ALWAYS assume the course is going to be long when training by GPS. 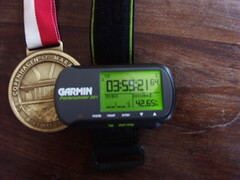 If you’re running race pace and using your GPS as a guide, then add a few seconds to the GPS time. Even better is to train using a measured course, since that’s what a race is anyway. I thought I’d chime in. I’ve actually used the gear that is sanctioned by the USATF to certify courses. If done right, the certification process is pretty darned accurate. On my running club’s web site, we recommend using a GPS device to measure a “Fun 5K” course as an expedient, but GPS watches are not up to the job of certifying courses. Of course the military uses GPS to locate things to within a few feet. Civilian GPS is not quite so accurate, but can usually locate something to withing a few meters. But while accurate in the arena of positioning the small errors made at each step along the way slowly pile up. Companies, like Garmin, that build single purpose devices put money into good, compact GPS antennas and use pretty sophisticated algorithms to try to smooth out these errors, and they build some of these algorithms right into the device. (Other algorithms, like the elevation algorithms, are done on software on their web site when you upload the data.) That’s why, for example, your Garmin watch is more accurate than using the Garmin app on your iPhone. The iPhone, being a Swiss Army knife, doesn’t have as good a GPS antenna, and the app doesn’t have all the sophistication of your watch. All that to say that, though they try to minimize them, the small positioning errors add up. In my experience, it can be on the order of several hundredths of a mile for a 5K, up to a tenth for a 10K, and obviously more for a marathon. That’s not much error for your weekend run, or for doing your mile repeat fartleks. But not good enough for USATF certification! This is timely…I ran the Oakland Half this weekend and my Nike Plus told me I did about 13.5 miles. I make no excuses…it was a bit of a disaster of a race for me…but it was definitely a long one. It had LOADS of twists and turns in, it doesn’t surprise me I ran long. This is a great article, and exactly what I’ve been looking for as I aim to achieve my dream time in Berlin later this year. I understand about the cornering etc etc, but I’m still trying to figure out, are you always pointing towards each corner, or when you are running a long straight, should you be on the very left, middle, or very right of the direction you are running? This explains my last mishap at a half marathon. My GPS showed 13.31 and I crossed in 1:59:30, so…phew at least I had that BUT I was aggitated because my REAL half pace was a bit better than that last little bit. I wasn’t horribly fatigue but a few extra water spots left me trying to make up for it in the end. I had a friend tell me that I wasn’t “running the tangents” and I had no idea what he was talking about. My first full is in about 2 weeks so this is GREAT info. My legs will be hating me enough…no need to add to the pain of pacing mishaps and extra miles. Lesson – if using your cheapo GPS to train for a half marathon run about 13.2 miles on your GPS and run the tangents when possible and you will be better prepared and have a more accurate race. I’ve had pretty good luck tracking certified courses closely to the gps tracking in my phone. But…Ran a 5k race in Avalon, NJ on 9/6 that tracked 3.3 miles on my gps and my time showed! My opinion, sometimes race organizers do get it wrong.